FSN uses VITEC IP video codecs for live streaming from Havana, Cuba. 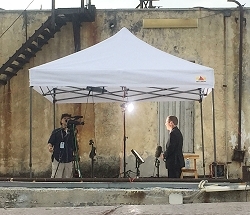 Sunnyvale, California, April 2016: News broadcast agency Feature Story News (FSN) deployed VITEC's MGW Ace encoder and MGW D265 decoder to stream live footage of President Barack Obama's monumental visit to Cuba. The footage was streamed live to the news agency's headquarters in Washington, D.C., and to the master control rooms of its global clients including those located in Turkey, South Africa, China, the United Kingdom, Germany, Mexico, and the Dominican Republic. With 100-percent hardware-based HEVC compression, MGW Ace enabled the news agency to stream broadcast-quality 1080i video with up to 50-percent bandwidth savings compared to its existing H.264 equipment. "Using VITEC'S MGW Ace and MGW D265 solution, our transmission of President Obama's visit in Cuba was a complete success," said Simon Marks, President of FSN. "Tropical storms shortly after the President's arrival in Havana disrupted the transmissions of traditional satellite providers, keeping several global networks off the air. We had error-free continuous coverage and were able to meet our clients' needs because of the reliability of the VITEC streaming solution." "We were delighted with the live shots that FSN provided from Havana," added Sophie Mokoena, the foreign editor and acting political editor at the South African Broadcasting Corporation. "There was huge interest in this story among our satellite TV and digital audiences all over the African continent. The live shots gave our viewers a great window into the evolving relationship between the U.S. and Cuba peoples and added a distinctive element to our programming. Even better, the transmission was easy to schedule, reliable, and extremely economical." After evaluating the market for solutions that would offer broadcast-quality resolution and low latency from an environment with limited access to bandwidth, FSN determined the MGW Ace — the world's first portable HEVC (H.265) hardware encoder — and MGW D265 decoder offered the best-in-class features for its global news team. With the portable point-to-point IP TV solution, FSN's news team was able to transmit two flawless streams from Cuba back to Washington, D.C. With Ace's field-proven H.265 compression and streaming technology, and Zixi® error correction, the news agency has a reliable and simple-to-use platform to report and transmit breaking news while in the field. The solution expands FSN's range of offerings by reducing its operational costs and by delivering error-free, low-latency high-quality broadcast footage even from locations with low bandwidth. "President Obama's visit to Cuba was a significant historical event, demanding reliable live news coverage," said Dan Quinn, federal sales director at VITEC. "Using our field-proven streaming technology, FSN flawlessly delivered its live streams back to headquarters — a testament to Ace's cutting-edge HEVC compression and streaming capabilities."